Perfusion techniques on cadavers are heterogeneous and imperfect. The objective of this study was to improve the existing circulation model for surgical simulation on cadavers. We used a three-step experimental approach. The first part of the experiment tested two variables: the type of circuit and the use of a heater for perfusion. The second approach evaluated two parameters: the injection fluid and the type of body conditioning (embalmed or freshly dead prepared using different washing techniques). The third one was an improvement on the best circulation obtained, which focused on the injection fluid. 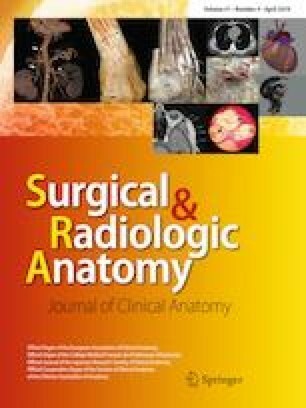 To compare the realism of these different techniques, we constructed a score with realism parameters: the volume of return flow, the presence of peripheral venous return and the perfusion of abdominal arteries. We found that the use of a heater seemed to improve the perfusion, while performing an arteriovenous bypass did not seem very effective. A correlation rate of 0.84 was found between the realism score and the injected fluid chosen. The best score (4/6) was found for a non-embalmed body with a low-pressure washing technique using a gelatin-based liquid at a concentration of 4 g/L for circulation. Scores obtained using embalmed bodies for both injection fluids for high-pressure washing or for 8-g/L gelatin injection fluid did not exceed 3/6. We showed that using a non-embalmed body with low-pressure washing and a 4-g/L gelatin-based fluid was the most effective technique for cadaver perfusion. AB: protocol/project development, data analysis, manuscript writing. JF: data collection or management, manuscript writing. QF: data collection or management, manuscript writing. SS: data collection or management, manuscript writing. CM: data collection or management, manuscript writing. PC: protocol/project development, manuscript editing.